Grubzon - A Gourmet Voyage: Opa! Bar & Cafe - Andheri Airport Road, Mumbai. The sun shone brighter than before. It was so hot that most of the crew wanted to stay indoors. The lookout sat in his spot with an umbrella and sunglasses. We sailed in unfamiliar and unexplored territory. I wondered if our next mark would be the place where we finally find the blue compass. There was commotion on the deck as I took out me looking glass and studied the horizon. There was a sandy island up ahead. It also seemed to have a large town on it. Time to restock and sample the local taverns. As the ship neared the coast, we almost hit a local fishing boat. Opa! Opa! which originally meant something on the lines of Oops in Greek is now often used in Greek celebrations or in high emotions. Opa! is a Middle eastern restaurant with some Greek and Turkish influences. Its located on the top of the Grand Peninsula hotel close to the Saki Naka Metro station. It could be difficult to find for the first timer, seek help from the hotel staff and thou shalt be fine. Opa scores highly on its thematic ambiance. It feels like a true Middle Eastern restaurant. It is comparable to the stuff I saw in Dubai and the pictures of fine dine destinations in Lebanon and Morocco. The wall decor feels like the remnants of old Arabian palaces and the furniture feels very Moroccan. Combined with the summer sun in India, one is literally transported to the locales of the Middle East or North Africa. 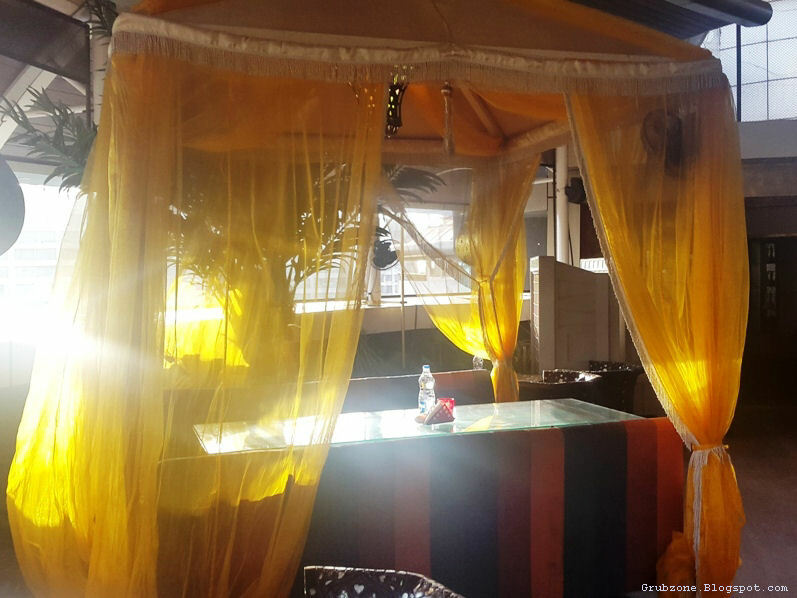 Opa has to be one of the finest roof top cafes in India. A true Arab Pavilion. This also presents a problem. The summer heat can be rather harsh and Mumbai's humidity can sap the strongest man's strength. The small fans were mostly ineffective in offsetting the ambient heat. Its not impossible to tackle heat in an outdoor cafe. I do know of a certain other rooftop tavern that uses industrial grade coolers to keep its outdoors cool even in summers. Opa! is quite well known for being a Hookah Bar as well. However, I don't smoke so I cannot describe well on that part. My friend however enjoyed the hookah facilities quite well. So I can claim that the Hookah is decent. 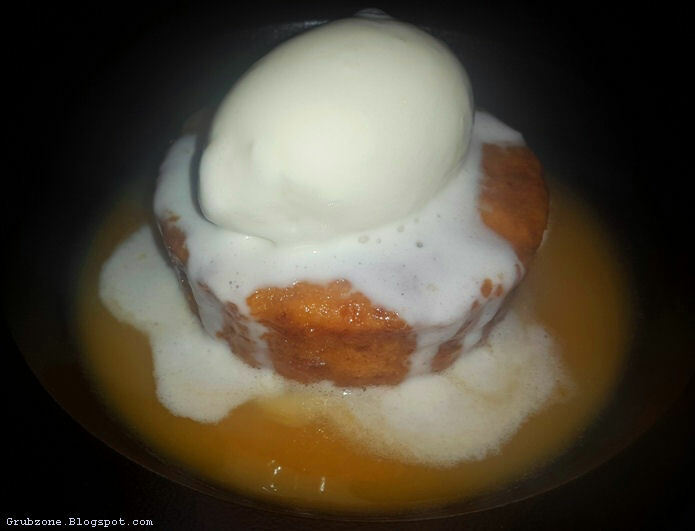 Opa scores high on food (mains and appetizers), mediocre on drinks and poorly on desserts. 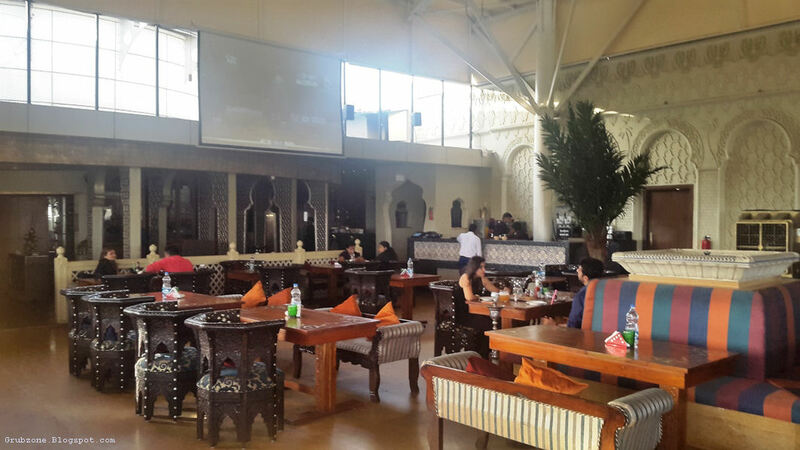 The ambiance, hookah and the food are the restaurant's strongest assets. Opa's special Whiskey Sour. 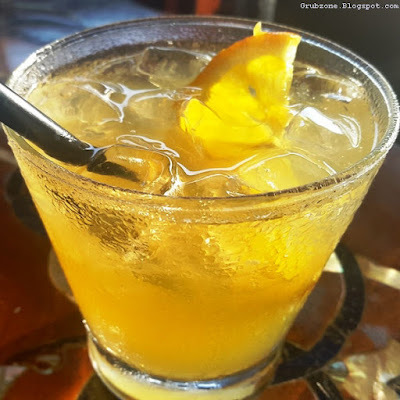 The color looked slightly atypical to that of the regular Whiskey sour. The drink was mildly potent. Its flavor was affected by the tremendous amount of ice put into it. It also felt too sweet. Due to the ice melting, the drink lost its flavor halfway through. The ice needs to be reduced to at least a third of what was put in. 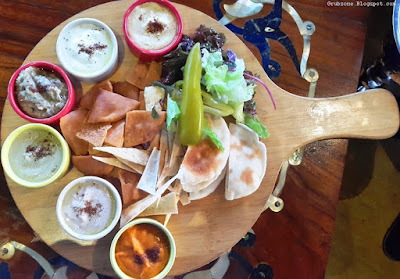 The Cold Mezze platter was served with an assortment of dips like Baba Ghanoush, Hummus and labneh with various breads. This served as a nice appetizer, side and a filler in between courses. The dips felt authentic and set one right up for the other courses. The Hot Mezze platter had an assortment of meat based appetizers like Adana Kebab, grilled chicken and Shish Taouk. There were also some greens and falafels. The meats were a passable fare save the Taouks which were juicy and delectable. I positively enjoyed the first platter more. Chicken Sheefa is a popular dish in the middle east and surprisingly England. It usually has breads of various shapes stuffed with soft minced meat. 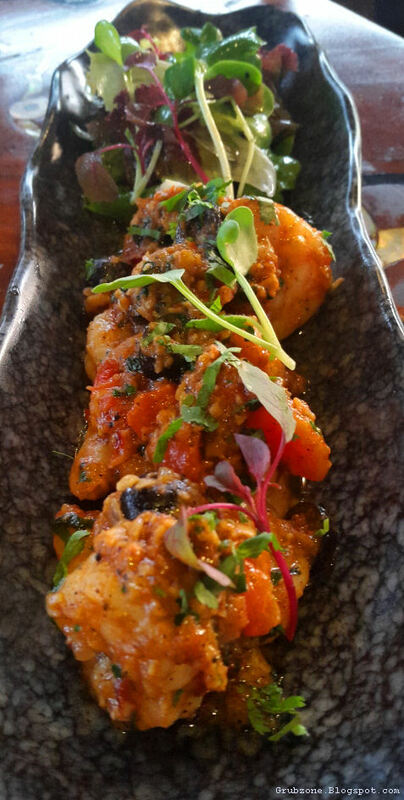 Opa's variants resembled pots which were stuffed with an aromatic and savory stuffing. The stuffing was made of minced meat and various spices. The buns felt fresh, soft and slightly sweet and the stuffing was delectable. 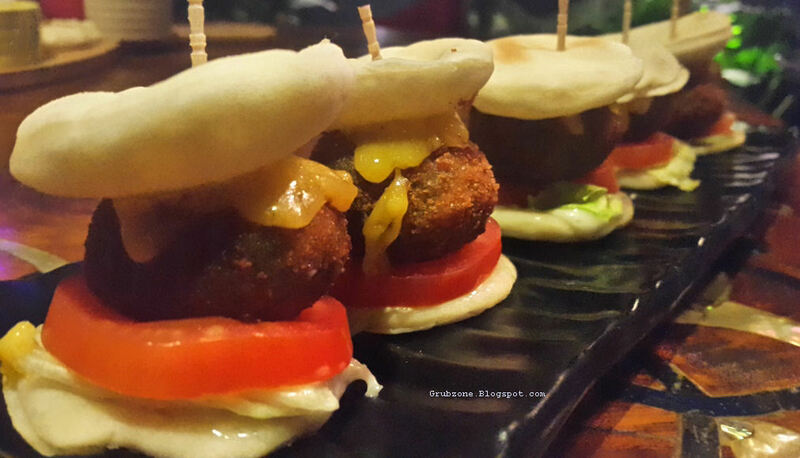 Though a Toum dip was provided with the platter, I found myself enjoying these buns on their own. To me, the sheefas were the perfect appetizers. The best in their class. Captain : I like these hot buns. Crewmate : Maybe we should focus on restocking. The prices here be cheaper than the last land. Captain : Its still twice of what we paid outside this sea. Crewmate : This is a desert island after all. No cultivation. Captain : But the lowered prices indicate an island nearby with cultivation. Arak Shrimps were made of pan tossed shrimps glazed with Arak. Rarely does one find the anise flavored Arak liquor in India. Its usually in the domain of five star hotels and big names. Opa brings it to the masses through its house specialty. The prawns tasted like everyday prawns sold at other places but the spicy and tangy flavoring made them delectable. The Arak added an unique twist which elevated a regular prawn dish to an elite prawn dish. A must if one loves sea food. Chicken Bruschetta was made of grilled chicken on a focaccia toast. A bit of cheese was added on the top as well. A herb seasoning had probably been used somewhere too. The chicken was tangy, juicy and savory. This made a good antipasto though the chicken would easily get dislodged from the bread making it slightly annoying. Time to move from the appetizers and side to the main like stuff. 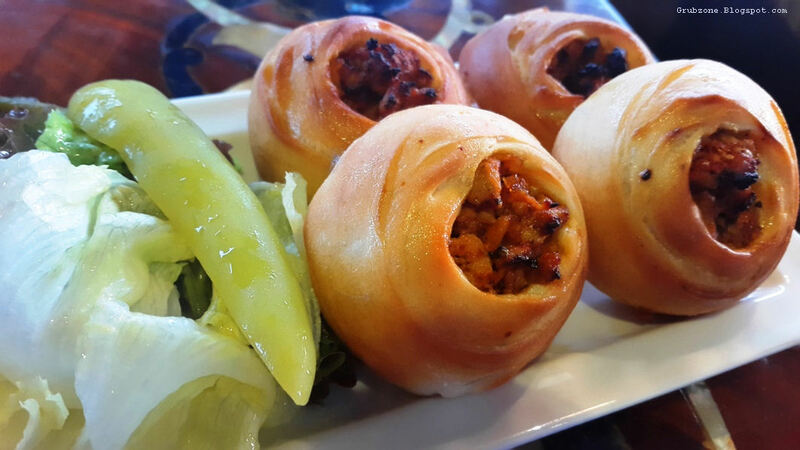 Chicken Pide is a traditional Turkish flatbread that resembles a boat or a rugby ball. 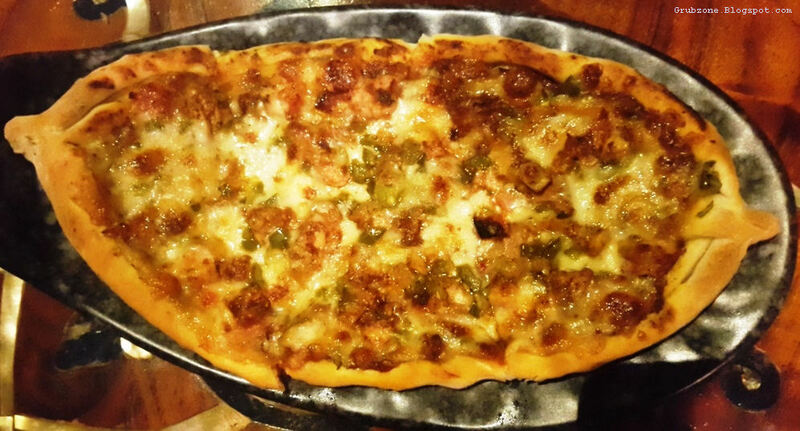 Pide is slowly making its moves and taking over from Pizza as the premier flatbread delicacy. Opa's variant had bright colors and flashy flavors. The chicken felt mixed and barbecued in flavor. The Rustic feel was in there. Pide uses butter instead of olive oil so it tends to be smoother in flavor. 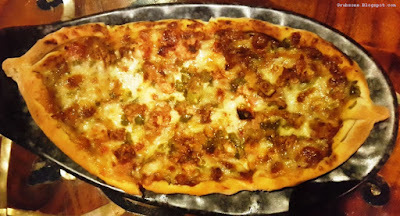 Opa's Pide was definitely the star among the mains. Crewmate : I like this Pizza. Captain : This is not Pizza. This is Pida...Pide! Vegetable Pita sliders were darlings in both visuals and flavors. 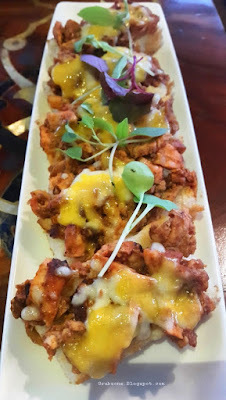 These were made from mashed potatoes, cauliflower, Bell peppers and Jalapeno. The flavor was very snacky. 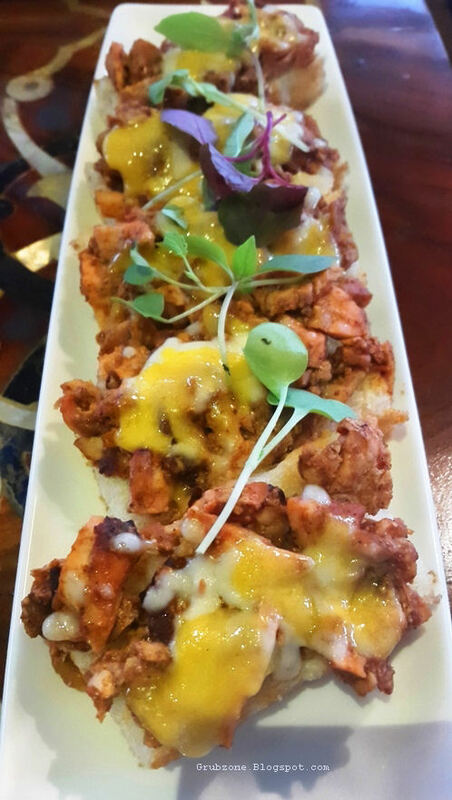 The chef used pita bread instead of Burger buns making it some kind of a fusion food. This is something that can get over fast in the midst of a happy conversation. Fish N Chips. 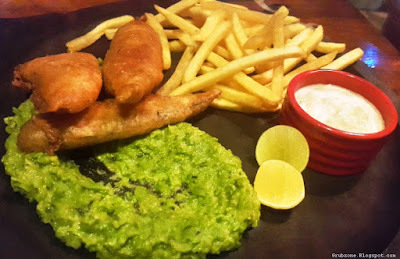 This was beer battered Pomfret served with mushy peas and tartar sauce. The presence of this item on the menu was surprising since its British but I suppose the menu included a bit of diversity. The fish was disappointing since it felt a little too salty and crumbly within. The batter was too thick as well. I have definitely had better fish and chips. Captain : Nina would you like some fish? Captain : Oh you don't like the batter coating, eh? What if I remove it for you? 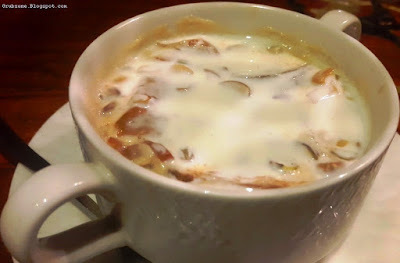 Baked Umm Ali is an Egyptian bread pudding. Its supposed to have a solid bread pudding base and its appearance should be more of a semi solid than a bowl of gloop. Opa's variant did not feel authentic. Sticky Toffee pudding was not as accurate as a traditional recipe goes. But the flavor was satisfactory. The pudding had more apricot than required mixed into the liquid below. This changed the flavor towards a tarty side. Minimal Toffee sauce was used on the sponge cake which sadly did not impart the typical toffee sauce flavor. The ice cream and the liquid salvaged the situation but otherwise I'd say that this was a pretty average dessert. The service at Opa was great. The servers made sure that our tables always had fresh cutlery, water and the chef routinely inquired about the quality of the dishes. The pricing seems slightly on the higher side as far as appetizers, drinks and desserts are concerned. Two of these three were off their mark on the day. The main's pricing felt at par or even lesser than other restaurants in town. And the mains (especially Pide) mostly won the day. To sum it up, Opa! has more in its favor if you are looking for a good meal. 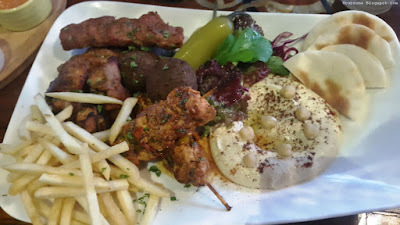 The ambiance (especially at night) and the food make up a genuine Middle eastern/Turkish/Greek fare. The drinks need a bit of balancing and the desserts need rework. Captain : We don't need to buy too many things here. The port activity suggests that there are islands nearby. Quartermaster : Just three days of stock. Your theory better be right. Captain : Studying the wares sold in market, I suppose its an Island with a lush Bamboo forest. First Mate : Ya know what? If you are right. I will do one week of deck sweeping but if you aren't, you will be doing the sweeping.